Thavorn Beach Village & Spa, Phuket is a 5-star hotel located in Nakalay Beach between Kalim beach and Kammala beach. It is about 4 kilometers from Patong beach. The area is very peaceful and quiet, so it is just perfect for refreshing, recharging, and relaxing. Thavorn Beach Village & Spa is one of not many hotels that have private beachfront so it is a good choice for those who like to escape from the crowd. 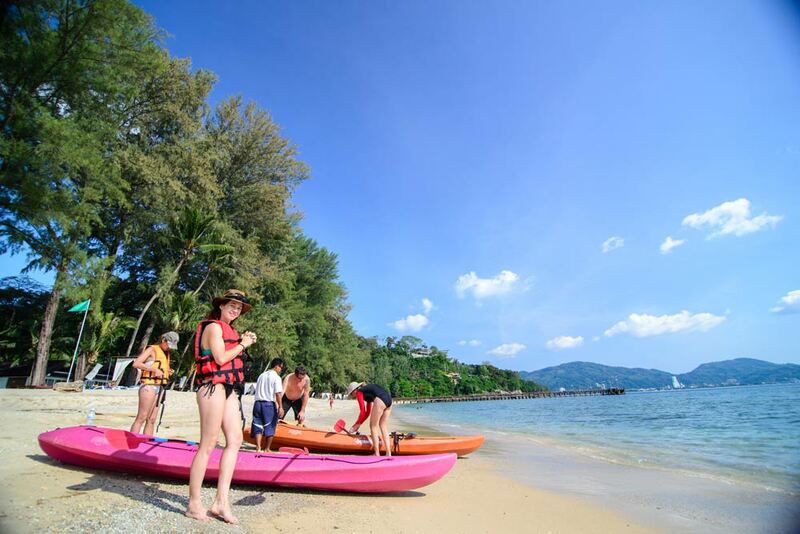 Thavorn Beach Village & Spa is in Thavorn hotel group which is one of the very first hotel groups in Phuket. 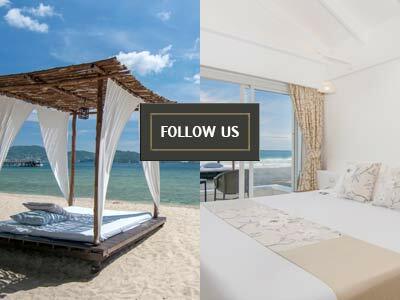 Thavorn hotel group has run hotel business for centuries and as 2 hotels including Thavorn Palm Beach Resort, Karon beach and this Thavorn Beach Village & Spa. This is the 4th generation of the hotel group who run the business and they have adjusted business strategy up to date. Thavorn Beach Village & Spa is on about 47 acres, divided into 3 zones including the Cottage, the Tropical, and the Hillside. 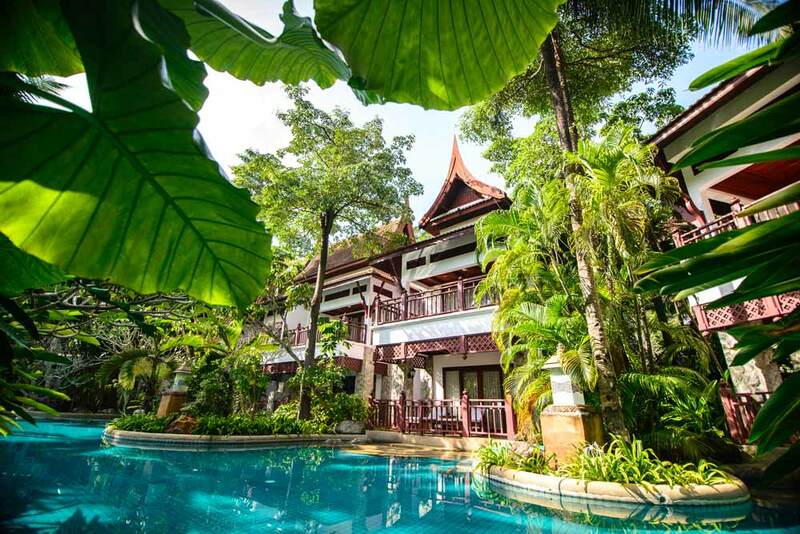 The hotel is in Thai-style with traditional Thai architecture. There is a lot of green spaces all around the hotel, it is very refreshing and calm the heat down a little bit. There is also a huge 4,900 Sqm – free form swimming pool surrounded the resort. Another highlight of the resort would be the one and only Cable Car used in the hotel in Phuket that can take you up to the Hillside zone. The resort is in Thai style which is well-matched with the greenery surroundings just like the concept of the resort “Where Thai Tradition Meets Nature”. Once we step out of the car by the lobby, we feel very refreshing. Not only the greenery surroundings everywhere but also a huge 4,900 Sqm – free form swimming pool surrounded the resort that make this place very special and perfect for a total getaway and relaxation. Let’s go and have a look at the guestrooms. As I have told you there are 3 zone of guestrooms which are the Cottage, the Tropical, and the Hillside. Let’s have a look at the 1st zone, the Cottage. The cottage zone is like a bungalow divided into 2 part, Beachfront Cottage with the sea view and Beach Cottage Partial sea view with gardens. 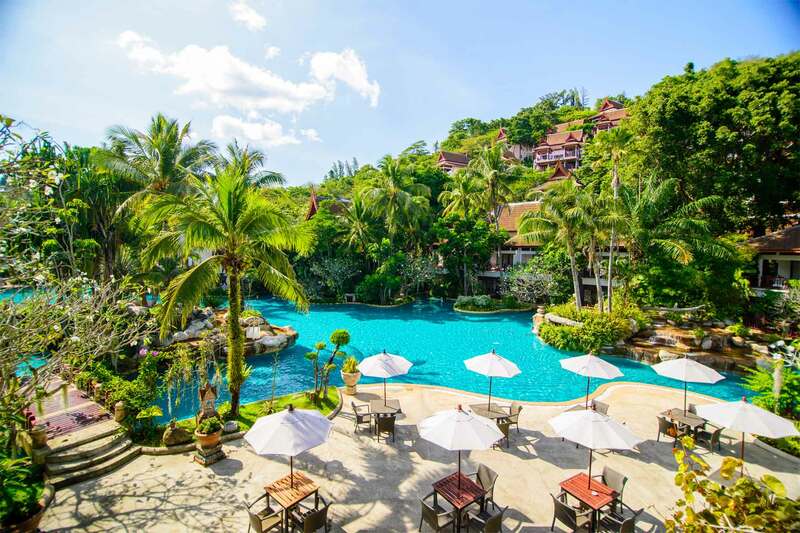 The Tropical is a Thai-style guestroom zone by the swimming pool with 2 types of guestrooms, Tropical pool view on the upper and the popular Tropical Pool Access on the lower. And of course the Tropical Pool Access is more expensive than the upper ones. The decoration of both types are all the same but some of them are with in-room Jacuzzi. And the last zone, the Hill. I stay here as well, it is like a hill side guestroom. They are also in Thai-style and they all have a sea view. Another highlight of the guestrooms in this zone is that some of them are with a jacuzzi on the balcony. 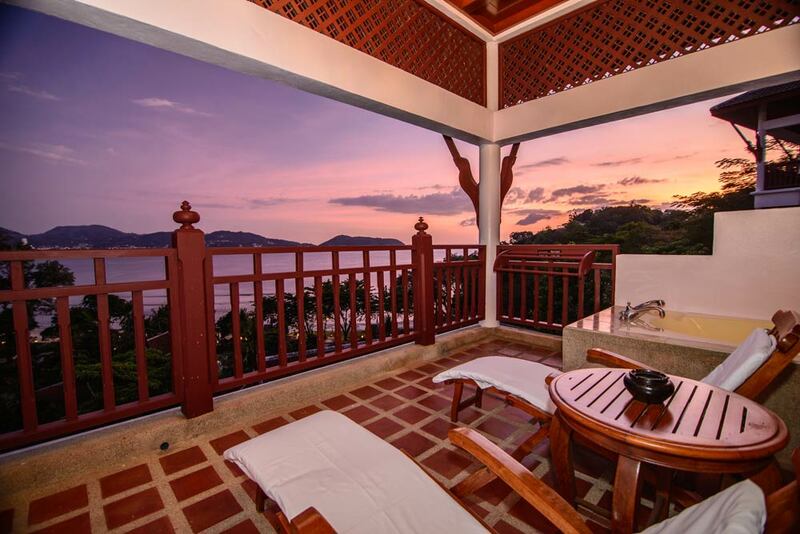 Therefore, you are able to dip in the jacuzzi while enjoying the amazing sea view and these types of rooms are called Hillside Ocean View with Jacuzzi. One more highlight of the resort is that there is a “Tropical Orchid Garden”. With the love and interest in orchid of the owner, they have created a wonderful orchid garden for those who like to see the beauty of Thai orchid. 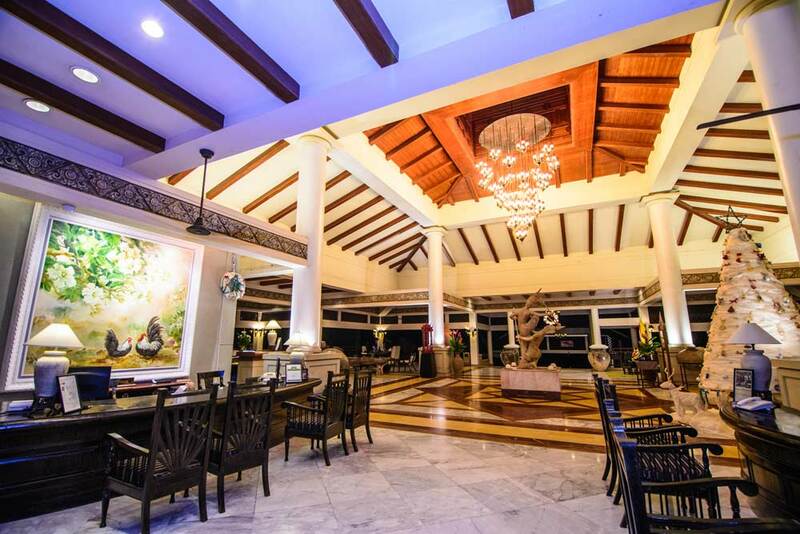 Almost the end of the day, let’s walk through the lobby at night. It is very beautiful and well-decorated with chandelier in the middle and clay statue from Thai novel. So it is a goodbye for now and I would like to say goodbye with this amazing sun set photo taken from Thavorn Beach Village & Spa at Nakalay Beach. 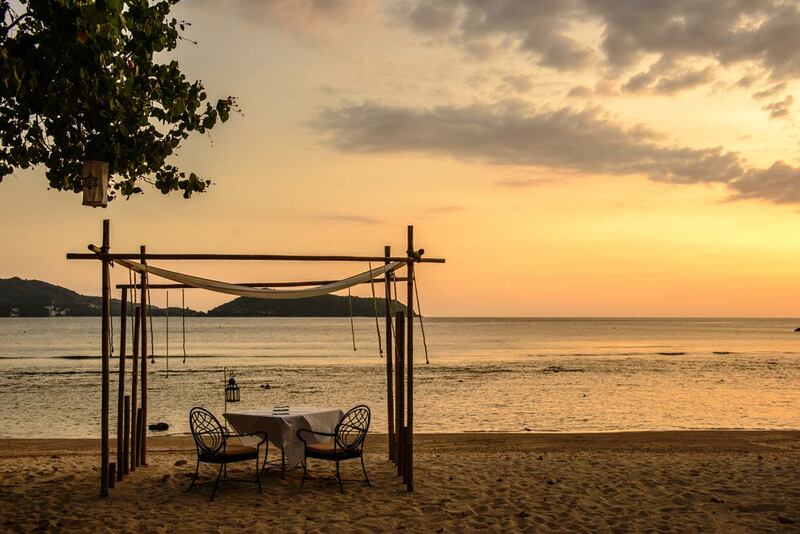 For those who is seeking for a 5-star resort with private beach and calm atmosphere for total refresh, recharge, and relax while enjoy experiencing Thai-style resort, Thavorn Beach Village & Spa, Phuket will be one of your best choices.